Enjoy the soup and happy Easter everybody!!! Happy Easter to you, too! I make a carrot soup like this sometimes and I am absolutely CRAZY for it. This looks delicious! 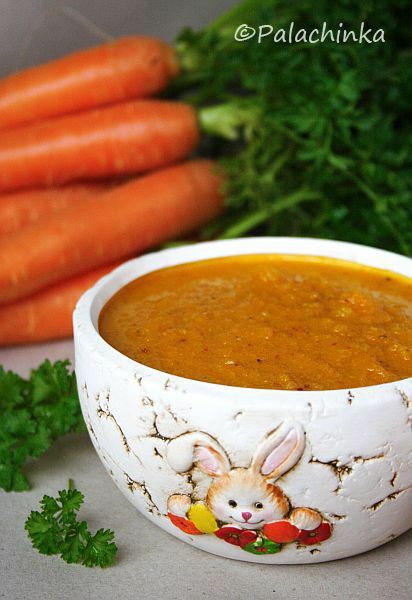 Lovely idea of using roasted carrots for the soup! I love carrots and I've always wanted to try making a soup with them. Thanks for the recipe! Obožavam juhu od mrkve, a ova zdjelica ti je preslatka. :)Sretan Uskrs i tebi. Kako je divna zdjelica, a i supica dakako. Yum! I love adding ginger or almonds to carrot soups. Such a simple and comforting soup!I looooooooooooooooove the bowl a lot, btw! I am not sure which I love more, the soup or the bowl! Simple and easy. I love it!